April 11, 2019, at 9:00 a.m.
See our Calendar section to find out what meetings and events are scheduled for this month. Friday, April 26, 2019 at 5:00 PM. For more information about how to submit a STARRS FY 2019 Grant Application, contact the STARRS staff at 314-421-4220 or email them at STARRS@ewgateway.org. This monthly newsletter provides updates on what has recently occurred and what is coming up next for the St. Louis Complex Coordinated Terrorist Attack (CCTA) Program. STARRS staff received over 60 investment justifications (IJ) for the potential of a FY 2018 Urban Areas Security Initiative (UASI) Grant award totaling $14,598,451. Feel free to contact any of the STARRS staff members if you have any questions or would like additional information regarding the FY 2018 UASI grant process. The STARRS vehicle travel log has been updated. 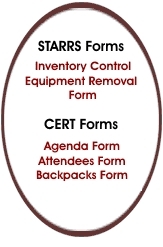 All agencies with STARRS procured vehicles should begin using the new log immediately. Contact Brian Marler for more info. You can be part of an extremely important group carrying out the analysis, planning, and implementation of enhancements to security in the St. Louis region. Consider volunteering for one of our committees. Go to Committee Sign-Up for more information. Items, including Dam Hazards, Shared Regional Critical Incident Resources and the 1993 Flood Extent, have been added to our available GIS-generated maps list. Visit our Maps page for additional interesting features. Want to read the minutes of past meetings or find out what some of the STARRS specialized jargon means? Check out our Library section. Here you can view past agendas, minutes, a glossary, even slideshows that were presented to our committees.